Utsa Patnaik is professor of economics at the Centre for Economic Studies and Planning, Jawaharlal Nehru University New Delhi. She is on the editorial advisory board of Social Scientist (Delhi) and Journal of Agrarian Change (London) and a life member of the All-India Democratic Women’s Association. Her most recent book is The Republic of Hunger and Other Essays (Delhi: Three Essays Collective, 2008). India has had a growing problem with food output and availability for the mass of the population since the inception of neoliberal economic reforms in 1991. A deep agricultural depression and rising unemployment rates resulting from “reform” policies have made the problem especially acute over the past decade. There has been a sharp decline in per capita grain output as well as grain consumption in the economy as a whole. Income has been shifting away from the majority towards the wealthy minority and a substantial segment of the population is being forced to eat less food and wear older clothing than before. This is exacerbated by the current global depression, which is further constraining mass consumption because of rising unemployment. In a complex and changing scenario it is useful to distinguish the long-term and immediate factors giving rise to the food problem, which are not unique to India but affect other developing countries including China. 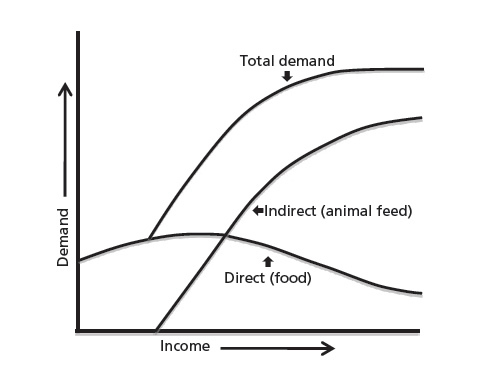 Policies that divert food grains to feeding livestock take food away from the already poor through a dual route: increasingly unequal distribution of income (and food) both within developing countries and between advanced and developing countries. The latter route is strongly associated with a second contradiction: between food consumption and exports. Under free trade policies that pressure developing countries to remove barriers to trade and shift their land use increasingly to exports, there is a contradiction between food for domestic consumption versus exports for the benefit of others. Finally, agriculture’s growing reliance on energy presents a third contradiction. We will see how these circumstances, taken together, thoroughly refute many popular assumptions about the causes of rising global food prices. The medieval European competition between food and feed arose from the fact that with very low productivity it was not possible to produce enough food grains for humans as well as feed to carry livestock through the barren winter. There was widespread seasonal livestock slaughter and high consumption of salt-preserved meat.1 The “agricultural revolution” of the eighteenth and nineteenth centuries in industrializing Europe did not fully overcome the problem of low productivity. There was an increasing dependence on wheat imports from colonies with temperate climates, and dietary and clothing diversification. Consumption of sugar, beverages, rice, and cotton by West Europeans depended heavily on unpaid import surpluses from colonially subjugated tropical areas.2 Colonized regions saw a decline in food grains for their own populations as land and resources were diverted to these exports. Demand for costly animal products is heavily concentrated among the well-to-do who thereby draw away grain for use as feed for animals, reducing direct consumption as food by the poor both at a global level and within a given developing country. Empirically observed conversion rates of grain to animal products are available for each level of technology, namely each unit of milk, eggs, meat, and so on can be decomposed into so many units of grain. The exact conversion rates vary depending on the degree of “industrialization” of livestock production. Taking the conversion rates for advanced countries, a liter of milk embodies 0.2 kg of grain, a kilogram of eggs or poultry meat is equivalent to 2 kg of grain, and so on. The larger the animal, the higher is the conversion rate with a kilogram of beef requiring at least 7 kg of feed grain. There is a clear association between the income of the individual or family and the total consumption of grain. Grain is consumed in two forms—first, direct grain consumption as bread, biscuits, cakes, etc., in advanced economies (boiled rice, roti, tortillas, pita bread, and so on in developing societies) and second, indirect grain consumption as animal products embodying definite quantities of feed-grain (milk, butter, eggs, poultry, and red meat). The total consumption of grains by humans is the sum of direct consumption and indirect consumption. Sources: J. S. Sarma and V. S. Gandhi, Production and Consumption of Foodgrains in India: Implications of Accelerated Economic Growth and Poverty Alleviation,Research Report 81 (Washington D.C.: International Food Policy Research Institute, 1990). Feed requirements for modern livestock production systems are described in Bhalla, Hazell, and Kerr (see endnote 7). National Sample Survey Reports on Nutritional Intake in India (see endnote 10) provide a detailed chart of calories and protein per unit of different food items. At increasing per capita income levels, an increasing amount of grain is consumed as animal products, so the total per capita grain consumption rises fairly sharply with rising income. The share of direct cereal demand in the household food budget does decline,4 but there is an absolute increase of total cereal demand and no decline in its overall share in the food budget. Chart 1 summarizes the empirical observation of direct and indirect grain consumption as per capita income increases.5 Direct grain consumption per capita is low in a poor economy, rises with rising income, then levels off and may decline once very high income levels are reached. The indirect demand for grain as feed to produce animal products is near zero in a poor economy, where consumption of animal products depends on hunting and natural grazing. As the society develops and industrializes, natural grazing tends to diminish and is replaced increasingly by stall feeding. As per capita income rises, the indirect feed demand for grain to raise animals goes up steeply and eventually outstrips the direct demand. The total demand for grain is the sum of the two curves and rises sharply as the economy achieves a high-income status. The United States had the world’s highest consumption of grain—nearly one ton per person per year by the mid-1990s, of which four-fifths was indirect demand. U.S. total grain demand is falling very slowly with a tendency towards healthier diets, but it is still the world’s highest at 900 kg, while the least developed countries only consume about 130 kg per person per year. Adam Smith remarked in his Wealth of Nations that there was a natural upper bound to the demand for food, since how much a person could eat was limited by the size of his stomach. He could not have foreseen the sharply increasing animal-products intensity of diets as populations grew better off. The per capita direct plus indirect grain demand of the United States, at 900 kg per year, is seven times the comparable per capita grain demand of the poorest nations, although North American stomachs are obviously not seven times larger. The required direct grain consumption for minimum daily energy intake for working and health is often not available to the poorest nations and any slight output or import shortfall can tip large segments of the population into famine. This not always because these nations produce too little grain to feed their populations, but because the end use of the grain they do produce is determined by the superior purchasing power of their own elites and of richer Northern populations. Eating the meat of large animals is a particularly wasteful way of satisfying energy and protein needs. A single half-pound beef burger eaten daily by a consumer in Brazil or the United States uses up enough grain to meet the entire total daily energy and protein needs of three people in India with a combined grain and milk diet. Advanced countries, with their beef-eating habits, have long been monopolizing the world’s grain supply, drawing away not only grain but also concentrates like oilcakes from developing countries for their meat industry. With 16 percent of world population, the advanced countries account for nearly 40 percent of the world’s cereal consumption. Within a given developing country, the middle- and high-income classes are able to corner the bulk of domestically consumed grain with a rising share for indirect use, while the low-income classes are deprived of even sufficient direct consumption to meet minimum needs. Consumption of animal products among the poor is not the result of modern forms of production, but depends on their fast-dwindling access to forest and water resources, for example trapping birds and fishing in the case of tribal people in India. A 10 percent rise in income leads to a 14 to 16 percent rise in demand for animal products in developing countries. With a current 8 percent GDP growth and 6 percent per capita income growth in India, consumption of animal products has been growing at 9 percent annually and so has the derived demand for feed grain, leaving a declining share for direct consumption. The rise in upper- and middle-class incomes thus has important implications in a developing country for the availability of food grains for the poor majority. The sharp food grain price rise in 2007–08 was widely attributed by Northern observers to the fast growing grain demand on the part of the well-to-do in China and India, where per capita income has been growing at between 6 to 9 percent annually for many years and the upper income groups show rising consumption of animal products. However, this is an incorrect argument for explaining global inflation in food prices. Commentators as disparate as George W. Bush and Paul Krugman were perhaps right to expect that total grain consumption per capita should have risen sharply in both countries. But they were wrong to think that this was actually happening, based on the unstated assumption that income distribution remained unchanged. On the contrary, owing to cuts in state development spending in rural areas, unemployment was rising and income disparity was increasing, with real incomes (money incomes adjusted for price change) for much of the population declining, forcing people to cut back on food. Higher costs of utilities like transportation, power, and health services forced further cuts in food spending. The data show that average grain consumption per capita declined sharply in both countries over the last decade, even though the upper income groups were increasing their demand rapidly. The statistics point to a severe compression of incomes and purchasing power for the majority of the population in India that more than canceled out the rise in demand on the part of the minority getting richer. Although we can establish this conclusively only for India, it is likely to underlie the decline in per capita grain consumption in China as well. The actual availability or demand for 2004–05 however was only 157 million tons. The deficit is 41.5 million tons in the first projection assuming 3.7 percent per capita income growth, and a massive 62.5 million tons in the more realistic projection based upon a 6 percent per capita income growth. These projections are far above observed consumption, even though the parameters used are reasonable. The authors had to make the assumption that the income distribution would remain unchanged,since there was no way they could have predicted the order of change in income inequality. In reality, however, we have seen increasing income inequality of the most adverse type—an absolute decline in real incomes for a large population segment, lowering the aggregate demand curve which is reflected in the steep decline in food grains availability shown in Chart 2. 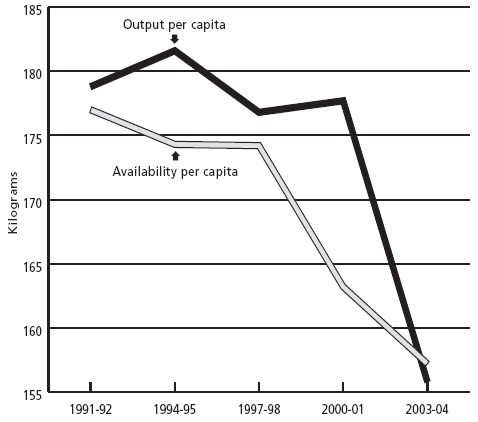 This decline was steeper than the per capita output decline up to 2002 after which output fell faster than did demand. The availability of food grains in a given year is a measure of the actual market demand and hence actual grain consumption by the population. To obtain availability, net imports (if any) and net drawing down of public grain stocks (if any) are added to net output. Net imports and drawing down of stocks will clearly mean availability or demand is higher than output, while net exports and adding to stocks means availability or demand is less than output.8 Abnormally high public food stocks, 40 million tons in excess of buffer norms, had built up by 2002. The role of neoliberal macroeconomic policies from 1991 onwards in raising unemployment rates, inducing severe contraction of mass consumption and rising levels of hunger, continue to be ignored by our economists and the government alike. Note: Output is Net Output = 87.5 percent of Gross Output, 12.5 percent assumed to be seed, feed, and wastage. Availability = Net Output + Net Imports – Net Addition to Public Stocks. This is the official definition. Both variables divided by total population for per capita values. Chart updated to 2004–05 from Utsa Patnaik, “Neoliberalism and Rural Poverty in India,” Economic and Political Weekly, July 28–August 3, 2007. The World Bank and the governments of India and China have been claiming reductions in poverty on the basis of an incorrect method, in which the definition of the poverty line has been altered. Both governments had defined the poverty line using a nutrition norm, i.e., an observed level of total household spending, whose food spending portion allows the consumer to access a specified minimum nutrition level. In 1973–74 in India, the correct nutrition-based rural poverty line for that year was forty-nine rupees per month (about six dollars at the exchange rate then), while in China 1984 was the initial year of analysis, and 200 yuan per year or 16.67 yuan per month was the rural poverty line. For later years, however, the nutritional norm was no longer directly used, even though the data were available; instead the initial poverty lines were updated simply using a consumer price index in both countries. This procedure does not capture the actual spending rise required to meet the nutritional standard as the economic environment changes over time. It leads to cumulative underestimation of the poverty line. Three decades further on, it has produced absurdly low current official poverty lines, for rural India 356 rupees per month for 2005. This is below 12 rupees per day (about 26 U.S. cents), which would not have bought even one kilogram of open market rice. This poverty line, it must be remembered, is the total spending meant to cover not merely the daily food need but also all other daily non-food expenses of fuel, transportation, apparel, health, education, and so on. Similarly in China the official rural “poverty line” for 2007 is 1,067 yuan per year or 2.92 yuan per day, while the cost per kilogram of the cheapest rice variety is 4 yuan. For comparison, if one posited a poverty line of around one dollar a day for the deep South of the United States, it might convey some idea of the absurdity of these official poverty lines. The objective of promoting free trade under IMF/World Bank-guided economic reforms, strengthened by the WTO discipline, has been to bring about an intensification of the international division of labor in agriculture, where tropical lands are increasingly required to produce the relatively exotic requirements of advanced country populations, keeping the supermarket shelves in the North well-stocked with everything from winter strawberries to edible oils and flowers. The resulting food grain deficits of developing countries, as they divert more land to export crops and specialized crops for internal consumption by the wealthy, are supposed to be met by accessing the global market for grains, which is dominated by the United States, Canada, and the European Union with Argentina and Australia as smaller players. The developing countries were told that food security, based on self-sufficiency in food grains production, was passé in a modern globalized world, even for large countries with poor populations. Rather, they would benefit from specializing in the non-grain crops in which they had a “comparative advantage” by increasing their exports and purchasing their grains and dairy products from Northern countries that had surpluses of these products. Developing countries were urged to dismantle their domestic systems of procurement of grains and distribution at controlled prices. These systems were mostly put in place after decolonization, precisely in an attempt to break free from earlier colonial systems of specialization and trade that had severely undermined nutrition standards. Historical memories are short, it would seem. Many developing countries, from the Philippines to Botswana, succumbed to sustained pressure and unwisely dismantled their grain procurement and distribution systems beginning in the mid-1990s. The model of export specialization that was thrust on developing countries, or unwisely adopted by governments, was always at the cost of declining food security for the mass of the people. The promises of increased export earnings and increased ability to access food from global markets proved misleading and false—even before the current inflation. With dozens of developing countries following the same policies of exporting much the same products, the per unit value of their exports declined and the terms of trade shifted against them. A doubling of the volume of exports over a decade means no increase in exchange earnings at all if it is accompanied by a halving of the unit export price. Most developing countries altered their cropping patterns but ended up with little or no rise in export earnings. Second, even if foreign exchange is not a constraint, governments do not privilege the interests of the poor, and officials in India continue to deny that hunger has increased. India has a mountain of foreign exchange and has removed restrictions on the free purchase of hard currencies by those rich enough to go on holidays to Europe or the United States. There is a tradition in India of operating food-for-work schemes in drought years—the state provides employment in public works and most of the wages are paid in grain from public stocks. However, there was no large expansion of food-for-work during 2002 and 2003, the worst drought years seen in two decades, despite a sharp rise in unemployment and fall in purchasing power that led to 64 million tons of unsold grain stocks. Instead, grain from public stocks was exported in record amounts, reaching a total of 22 million tons. Agrarian distress was the main cause of the government being voted out of power in 2004, but the new government did not import grain to provide relief. Finally, in 2006, after sustained agitation by progressive forces and the left parties, a National Rural Employment Guarantee Act was passed, which guarantees 100 days of employment per worker to every rural family seeking work. It is very clear by now that the decline in food grains output per capita in the developing world has been far greater than the increase in developed countries, thus leading to a global decline in per capita output and availability. The 1980–85 per capita world cereal output of 335 kg per year, declined to 310 kg by 2000–05. Among developing countries, China and India, which together accounted for over 30 percent of world cereal output in the early 1990s, contributed significantly to this global decline.12 Let us consider the eleven developing countries—China, India, Indonesia, the Philippines, Thailand, Vietnam, Iran, Egypt, Pakistan, Bangladesh, and Sri Lanka—which together contributed 40 percent of world cereal output. Over the thirteen year period between 1989–91 and 2003–04 we find a mere 15.6 percent rise in cereal output from this group, a rate of growth of only 1.1 percent per year, well below the nearly 2 percent population growth rate of these countries. At the same time, the output of their export crops have been rising fast, up to ten times faster than food grains, owing to the diversion of land and resources to export crops. Why should there be a drastic slowing down of growth in food grains output as developing countries follow economic reforms and liberalize their trade? The reason is simple at one level, and profound at another. Land is not a product of human labor and has to be conceptualized as akin to fossil fuels, since the supply of both is fixed. Nor is land homogeneous in its productive capacity, since warm tropical lands produce not only a far larger variety but also a qualitatively different output mix compared to the cold lands of advanced countries. The historical motive of acquiring control over tropical biodiversity was a major driver of colonial subjugation of other nations by the Western Europeans. By setting up slavery—and later indentured labor-based plantation systems—a steady stream of tropical goods and raw materials was obtained, both to diversify European diets and clothing, and provide the raw material for new industries. The colonized Indian peasant starved while exporting wheat to England, and the modern Indian peasant is eating less while growing gherkins and roses for rich consumers abroad. The rapidity of the decline is explained by the fact that deflationary reform policies have cut back public investment in agriculture at the very same time that they pushed for more exports, so yield growth is falling and there is not the slightest possibility of maintaining both exports and domestic grain production from a total planted area that remains constant. The long-term imbalance produced by decelerating food output growth and falling per capita output in the world economy during the 1980s and through the 1990s became invisible to people because no unusual inflation was seen. On the contrary, price deflation occurred in many developing countries, precisely owing to the IMF-guided income deflating mechanisms that depressed mass incomes, and hence effective demand and consumption, in virtually all developing countries. The peasantry and labor, both rural and urban, in developing countries worldwide ate less and less and absorbed the punishment, while urban intellectuals en masse seemed to be conceptually blind and largely ignored the problem in their writings. Owing to this suppression of inflation via the reduction in mass demand in developing countries, most observers did not understand the gravity of the situation. A shock or trigger was required to make the long-term imbalance and decline in nutrition explicit, and this shock has now come, largely owing to the United States misadventure in Iraq, the global oil price rise, and consequent large-scale diversion of grain to biofuel production in advanced countries. The main sources of energy for centuries before the widespread use of fossil fuels were feed crops for animals used for soil tillage, traction, and transport. From the mid-nineteenth century to the present in the industrializing world, agricultural crops received some respite from energy demands as coal, oil, and gas driven motors took the place of oxen and horse power. With the gradual slipping away of political control by advanced countries over world fossil fuel resources, agriculture is once again under pressure, now to produce biofuels (also called agrofuels) as a fossil fuel supplement and substitute. Source: U.S. Department of Agriculture data. In the United States, which aims to maintain its energy-intensive automobile–based lifestyle in the face of the global oil price upsurge, there has been an almost four-fold rise in corn going into ethanol production in a mere five years, from 27 to over 100 million tons (projected) between 2002–03 and 2008–09, aided by heavy subsidies. The European Union too has been diverting grain to ethanol production while Brazil has long engaged in using a substantial part of its sugarcane output for this purpose. 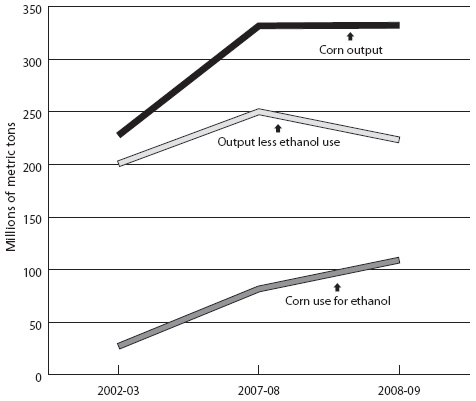 In 2008 a smaller projected U.S. output of maize did not deter the diversion of almost a third of output to fuel production, implying a downturn in the net supply for other uses (chart 3). The model of free trade and export specialization that has been thrust on developing countries now stands explicitly discredited. The question is where the developing countries are to go now, with the large-scale diversion of food grains to fuel production in the North and the resulting disappearance of global food stocks and food price inflation. For India there is only one alternative, to launch a campaign to grow more food with the same urgency that it had after the Second World War, because per capita food output has plunged back to the level of fifty years ago and it can only import now at an exorbitant price. While India, in the last fifteen years of neoliberal reforms and trade liberalization, has gone quite a long way along the same slippery path of falling agricultural investment and export focus that other smaller countries have followed for three decades, it is still in a position to reverse a worsening situation provided the goal of growing more food is addressed on an urgent basis and mass purchasing power is restored. Fortunately India’s public procurement and distribution system has not been completely dismantled as in many other developing countries. This has the potential for protecting poor consumers, provided that it is revived on a larger scale. This requires appropriately higher procurement prices for crops including the commercial crops, and the active setting up of cooperative groups to reclaim waste land and to cultivate jointly for food production, as is being done in Kerala, a traditionally food-deficient state, with positive results. Farmers seem to be responding to the substantial rise in the central procurement price for wheat and rice, belatedly announced in late 2007, and there was some, though so far inadequate, revival of food grains output during 2007–08. ↩ B. H. Slicher van Bath, The Agrarian History of Western Europe A.D. 650-1800 (London: Edward Arnold, 1963). ↩ For import surpluses see R. Davis, The Industrial Revolution and British Overseas Trade (Leicester: Leicester University Press, 1985); for the unpaid nature of these see U. Patnaik, “Export-oriented agriculture and food security in developing countries and India,” Economic and Political Weekly 31, nos. 35–37, (1996), reprinted in The Long Transition—Essays on Political Economy ( Delhi: Tulika, 1999) and U. Patnaik, “Theorizing Food Security and Poverty in the Era of Neoliberal Reforms,” Social Scientist, September–October 2005, http://www.mfcindia.org. ↩ The different grains have slightly different calorie and protein values per unit but on average one kilogram of cereal gives 3450 kilocalories and 100 grams of protein. ↩ Ernst Engel argued on the basis of household budget studies that the food share of total spending declines as the per capita income rises, and this has been extended in subsequent studies to show that within the food group the share of spending on cereals declines with rising income. ↩ P. A. Youtopoulos, “Middle-Income Classes and Food Crises: The ‘New’ Food-Feed Competition,” Economic Development and Cultural Change 33, no. 3, (1985). ↩ G. S. Bhalla, P. Hazell and J. Kerr, Prospects for India’s Cereal Supply and Demand to 2020 (Washington DC: International Food Policy Research Institute, 1999). ↩ The growth rates work out to 3.431 percent 2.529 percent respectively. ↩ The only missing element is change in stocks with private traders on which data are not available. ↩ National Sample Survey Organization (NSSO), India, Report No. 405, Nutritional Intake in India, 1993–94, and No. 513 for 2004–05, http://www.mospi.nic.in. ↩ My critique of the official procedure that is the basis of the World Bank’s poverty estimates, and my nutrition based poverty estimates for India, are available in a number of papers including U. Patnaik, “The Free Lunch—Transfers from the Tropical Colonies and their Role in Capital Formation in Britain during the Industrial Revolution,” in K. S. Jomo, ed., Globalization under Hegemony (Delhi: Oxford University Press, 2006), and U. Patnaik, “Neoliberalism and Rural Poverty in India,” Economic and Political Weekly (July 28–August 3, 2007. While the official estimate of rural persons in poverty in 2004–05 is 28.4 percent, it is not mentioned that this population is below 1800 calories energy intake, far below the 1973–74 nutrition norm of 2200 calories per day which had produced 56.4 percent in poverty. Directly applying this nutrition norm of 2,200 calories to current data gives us 69.5 percent of rural persons in poverty, sharply up from 56.4 percent in 1973–74 and 58.5 percent in 1993–94. In short there was hardly much change between 1973–74 and 1993–94 but the subsequent decade of economic reforms has substantially increased poverty. See also National Sample Survey Organization (NSSO), India, Report Nos. 402 and 508, Level and Pattern of Consumer Expenditure, 1993–94, and 2004–05, respectively, http://www.mospi.nic.in. ↩ U. Patnaik, “Export-oriented agriculture and food security in developing countries and India,” Economic and Political Weekly 31 nos. 35–37, 1996, reprinted in The Long Transition—Essays on Political Economy (Delhi: Tulika, 1999); U. Patnaik, “On the Inverse Relation between Primary Exports and Domestic Food Absorption under Liberalized Trade Regimes” in J. Ghosh and C. P. Chandrasekhar, eds., Work and Wellbeing in the Age of Finance (Delhi: Tulika, 2003); U. Patnaik, “Global Capitalism, Deflation and Agrarian Crisis in Developing Countries,” Social Policy and Development Programme Paper Number 13, United Nations Research Institute for Social Development (UNRISD) October 2003 (shorter version under the same title in The Journal of Agrarian Change (January–February 2003). Some other papers have been included in U. Patnaik, The Republic of Hunger and Other Essays (Delhi: Three Essays Collective 2008). ↩ United Nations Food and Agricultural Organization database, at http://www.faostat.org. ↩ Police records show that from 1997 to 2006, farmer suicides totaled 166,304, concentrated heavily in export crop producing states. See K. Nagaraj, Farmer Suicides in India (2008) at http://www.macroscan.org.